The SpaceX Dragon has been promoted, carrying its first live mammals next mission. The Dragon will be carrying 40 mousetronauts for a three-week stay in space. This is an important step to certifying the Dragon for crewed flights. The Dragon just returned with a hold full of scientific samples, but it's already time to start planning the next mission. For its fourth supply run to the International Space Station, the space freighter will be carrying four rodent habitat modules. Each habitat is roomy enough for a complement of 10 mice or 6 rats. The rats can scamper around the habitat by grasping on grids lining the enclosure. The modules have food, water, lighting, and fresh air for the microgravity-explorers, and a suite of sensors to monitor environmental conditions. For bonus science-stalking, the habitats are also wired for visible and infrared video surveillance, allowing the crew and Earth-based scientists and veterinarians to monitor behaviour and health of the inhabitants. 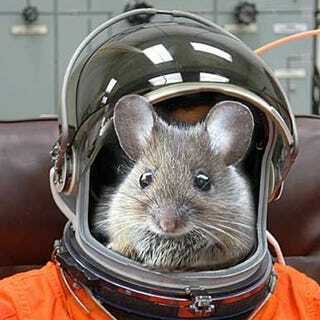 Of course, no story involving space-bound mice is going to have a happy ending. After their journey into microgravity, these mice are bound for a quick death and dissection so scientists can investigate muscle atrophy. I'm sorry, little mice; enjoy the view while you can, and thank you for contributing to our medical understanding that will permit longer-duration space voyages. You can read more about the research program here. As the first live mammal cargo for SpaceX, this is a step forward on getting the Dragon certified for crewed flight, which looks like it's going to be essential if we want to keep visiting the International Space Station after 2020.